2001 On 16 February 1962, a very stormy day, Karin Pratsch gave birth to her first son Christoph in a hospital in Potsdam near Berlin (Germany). The young family - Karin and Harald Pratsch had just finished their degrees at an agricultural college - lived in Kemnitz near by Potsdam. 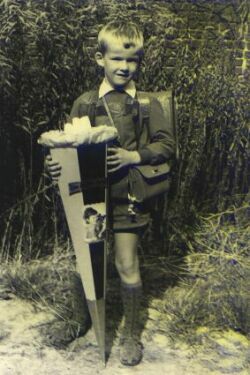 In August 1968 - just before I started primary school - we moved to Milow upon the Havel river. My parents still live there. After 8 years of attending the village school I entered the grammar (high) school in Rathenow and did my A-levels in 1980. 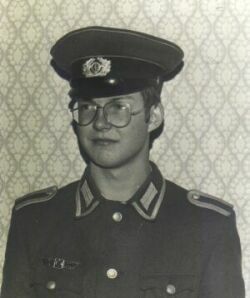 Somehow I endured 3 years military service before enroling at the Humboldt University 1983 to gain a degree in physics. The dissertation carried the title " Transport of electrons in quasi-two-dimensional systems at deep temperatures and weak electrical fields". Any questions? That meant basic research on electronical components that became tiny and tinier. 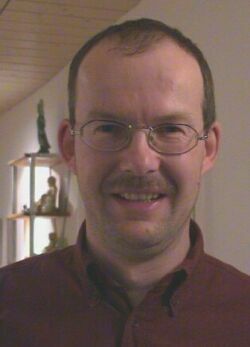 After university I did further research on the same subject as a scientist at the Ernst-Moritz-Arndt University in Greifswald. How knows what had become of me if the Berlin Wall had not come down, socialism crashed all together and the german re-unification hadn't taken place. I stayed at university, began working on my theses for a PhD. But didn't see any perspective in my job and started a marketing and publishing career, distributing regional literature that finally led to quiet some debts and to mental problems. What was left were a great many experience and my love to the "Ivenacker Eichen" (ancient oak trees in Ivenack). Thus, I started a new career in 1998. As I was quite familiar with micro computers (early IBM PCs) I attended a computer course in Berlin and gained the certificate of a MCSE (Microsoft Certified Systems Engineer). After working as a consultant and lecturer for computer networks and database software (especially Microsofts SQL Server) I am now Service & Support Manager for the alfabet AG in Berlin.